It’s been a full three months since my last book binge but you didn’t think I was being good, did you? Of course not. I really should spread this out more so that I don’t look like some crazy book buying lady. Really, I’m not that bad. REALLY. As you can see, I’ve actually read some of them. Well done me. 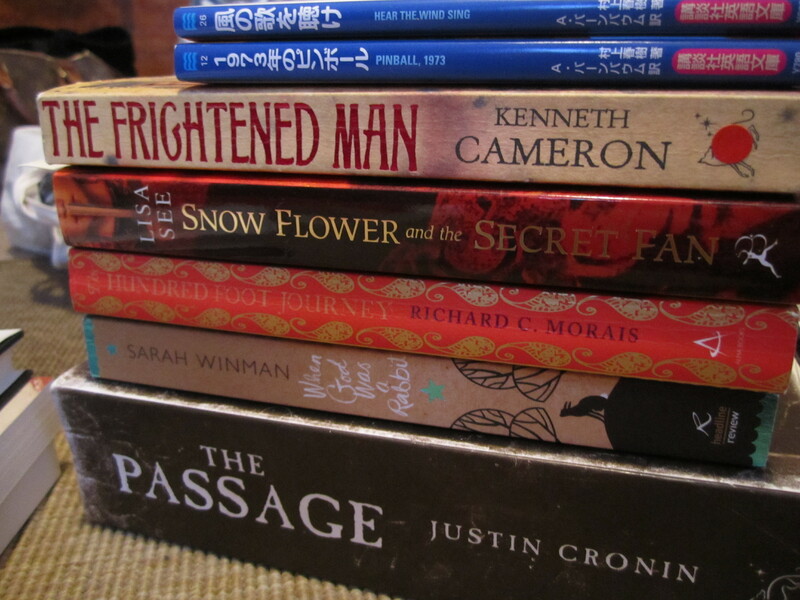 The Frightened Man by Kenneth Cameron – I gave an iffy feedback on Amazon marketplace and received this as an apology which was totally unexpected. They asked me to pick another title which I did. Now that’s what I call service. When God Was A Rabbit by Sarah Winman – ditto. Actually I just realised that I was under the illusion that this was Grace Williams Says It Loud by Emma Henderson. Too many books have mushed my brain. D’uh. The Passage by Justin Cronin – lent to me by the lovely Polly. Dying to read this book. Fiesta: The Sun Also Rises by Ernest Hemingway – Just wanting to read more by Papa Hemingway after A Moveable Feast. This is his first novel. Actually I kept thinking this was The Garden of Eden (his last novel) which was the book I wanted to read. D’uh again. The Elegant Universe by Brian Greene – I felt like I needed to find out more about superstring theory, dark matter and dark energy after attending a fabulous talk by Prof. Jocelyn Bell Burnell at the Southbank. This seemed accessible and I saw one of Greene’s programmes on telly a few years ago which was fascinating. The State Councillor by Boris Akunin – the 6th in the Erast Fandorin mystery series after Special Assignments. This Night’s Foul Work by Fred Vargas – this was 40p at the library sale. What can I say? I LOVE Vargas. OK, let’s get down to business. 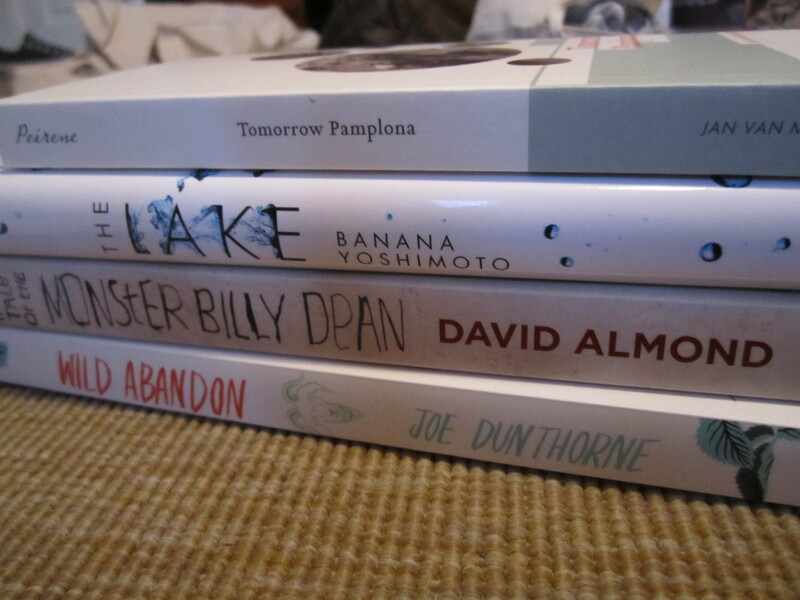 Here comes all the books I’ve bought. To be fair, this pile is from charity shops and the Notting Hill Book Exchange where I swapped books for vouchers and promptly used them to buy more books, as you do. The Dragon Painter by Sidney McCall – who is actually Mary McNeil Fennollosa, Asian scholar and who actually lived in Japan. Officially intrigued. It’s a novel set in Japan and has dragons in it. ‘Nuff said. Illyrian Spring by Ann Bridges – totally influenced by Book Snob. It’s out of print which makes it even more desirable. It’s a pretty tatty version so I’m pimping it up with a hand drawn book cover. The Revenge of Moriarty by John Gardner – to go with my matching copy of The Return of Moriarty. And it’s about Prof. Moriarty. I had to get it, right? We Have Always Lived in the Castle by Shirley Jackson – I’m keeping this for Halloween. This time I’ll read the scary book at night unlike with The Woman in Black. Promise. The Golden Mean by Annabel Lyon – I’ve had my eye on this for a few years so snapped this one up. It’s all about Alexander the Great and his teacher Aristotle. Schopenhauer’s Telescope by Gerard Donovan – I got this purely because of the title. No sane person would leave it. The Sunday Philosophy Club by Alexander McCall Smith – I’ve read a couple of the Precious Ramotswe books which is nice and cosy, but this is the one I’m really interested in. Especially after hearing AMC talk at the Southbank. What an absolutely charming man. Yes, if you are charming it does influence my wish to read your books. The Yiddish Policeman’s Union by Michael Chabon – I’ve been wanting to read this, like, forever. The Dig by John Preston – it’s a novel set in the 30s about the dig at Sutton Hoo on the eve of WWII. ‘Nuff said yeah. Enchanted April by Elizabeth von Arnim – this is all Simon T‘s fault. The Red House Mystery by A.A. Milne – it’s a mystery and it looks kind of golden-agey. And it’s by the author of Winnie the Pooh. Girl Reading by Katie Ward – now this is just getting silly. What kind of crazy book lady would I be if I passed on this one? The Watchers by Jon Steele – apparently this is Gaiman meets The Bourne Identity. I’m interested because there’s something about cathedrals and supernatural beings. Nocturnes by Kazuo Ishiguro – for my book group. I LOVE Ishiguro. Apparently The Unconsoled is what he should be famous for. Maybe I should get that too as I haven’t read it. 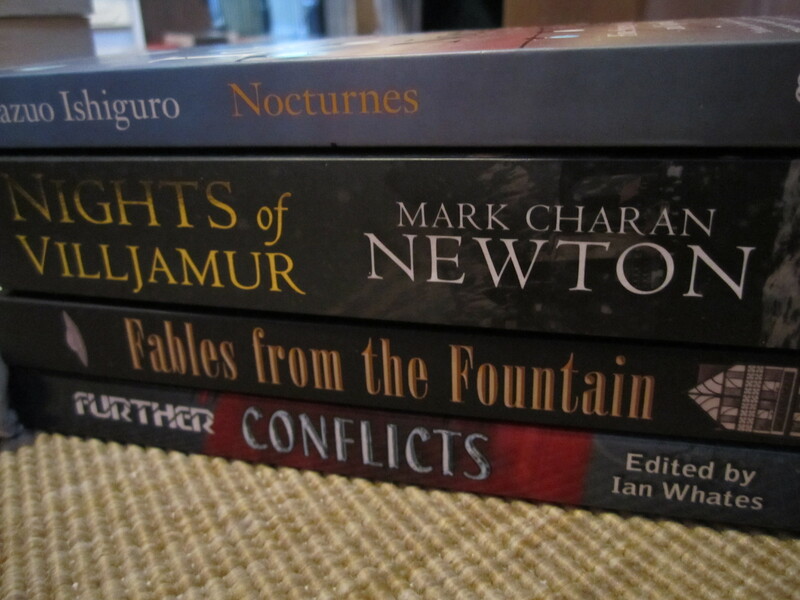 Nights of Villjamur by Mark Charan Newton – Fantasy. And apparently a very good one too. Fables from the Fountain and Further Conflicts both edited by Ian Whates – I got this at the SF tweet-up I went to to see the SF exhibition at the British Library. Short story collection by some great writers including Gaiman! 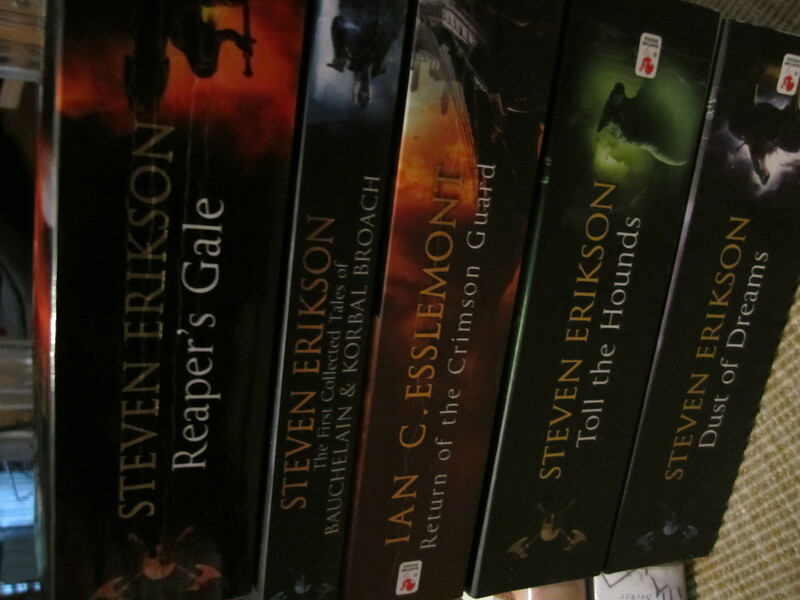 And I’m on a Malazan roll if you haven’t noticed. I just had to get them all so that I can properly concentrate and finish them this year. So, any of these familiar to you? And did I overdo it again? wOW!! that is a lot of books!! And the variety of the books is great…you don’t just read 1 kind. I am curious why you give feedback to amazon? I saw your first picture and thought to myself Four books isn’t bad–that can hardly be classified as a binge. And then I saw your other pictures! So many books! 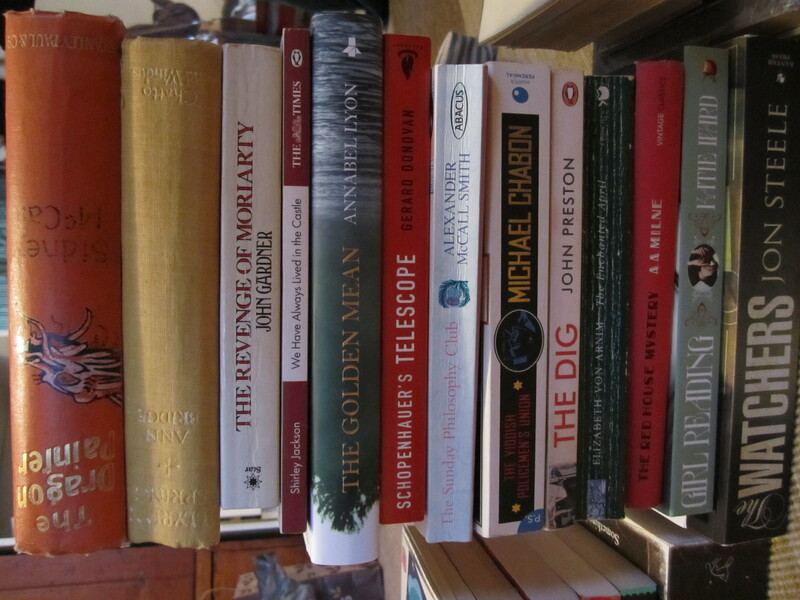 And I agree with Amy – there’s no possible way you can go overboard when it comes to books! It looks like you’ll have plenty of great stuff to keep you busy in the coming months! What overboard? This is perfectly normal behaviour for a bookaholic! love your books. All of them specially I would be looking for Illyrian Spring. The Enchanted April is wonderful. Elizabeth von Arnim is a great writer. Fiesta is a classic and excellent piece, make sure you read it if you haven’t already. By my standards buying any book is over doing it! Do let us know what you think of “The Elegant Universe”. None of the others are at all familiar to me. Good grief! Do you have to tiptoe about your flat for fear of the heaps of books toppling? Ha ha, it’s interesting to see the replies varying from one extreme to the other. I have to say I do recycle all my books and give a lot away to my sister, friends and charity shops, just so I can have more space to buy more books! Bloomin eck! I’m so envious..I have had to rap my knuckles and serious limit my book buying because I am running out of money, and room! I loved ‘When God was a Rabbit’ by Sarah Winman. It’s such a cosy, heatwarming book. I met her at Savidge Read’s salon earlier this week and she was so engaging 🙂 I hope you enjoy it as much as I did! That’s some pile(s)! 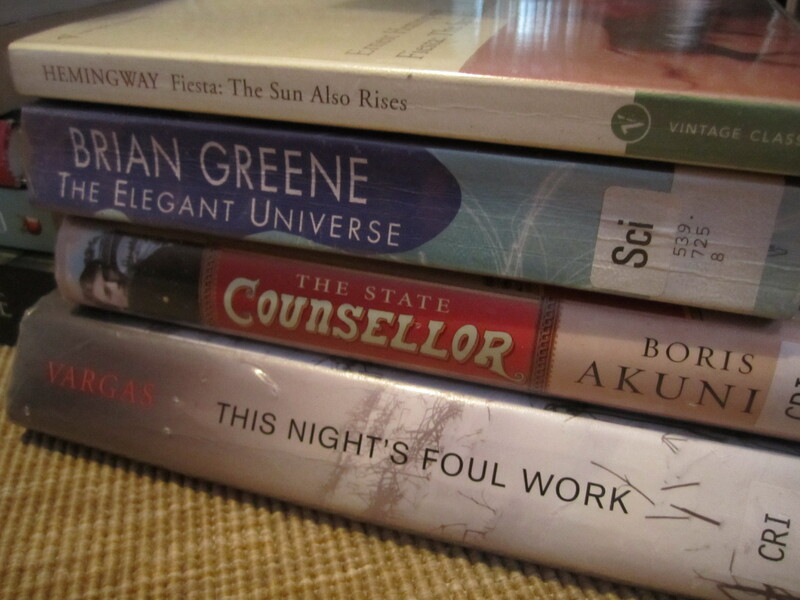 I’m reading …Billy Dean at the mo. Will be interested to see what you think of it. The other title I’ve read and loved in those piles was ‘The Dig’ which I adored. Wonderful collection there you have! Make me salivate! Enjoy your loot! Book binge indeed! I’ve got some of them in my book sale boxes (I went on a book binge too, the annual charity book sale in our city in June) Like you, after reading A Moveable Feast, I’m now starting to read The Sun Also Rises. I’ve got The Golden Mean at the sale. It’s a Canadian novel and had made quite a splash a few years ago here after being shortlisted for the Giller’s in 2009. Nocturnes is a quirky collection of short stories. I’ll be interested to see what you think of it. Hi Arti, I’ve actually read some of the titles listed here (see how behind I am at posting!) including Nocturnes. I also finally got a copy of The Paris Wife by Paula McLain about Hemingway’s first wife, Hadley, so am looking forward to a Hemingway binge! Wow, well done! You definitely didn’t overdo it. A lot of these are on my TBR pile. Tsk, there is no such thing as overdoing it where books are concerned! 😉 Enjoy! Ah!! You have Pinball 1973!! I have Hear the Wind Sing, and I really really want Pinball. Any idea how I can get it without going to Japan?